Earn $34.12 in Rewards credit (3412 points) What's This? 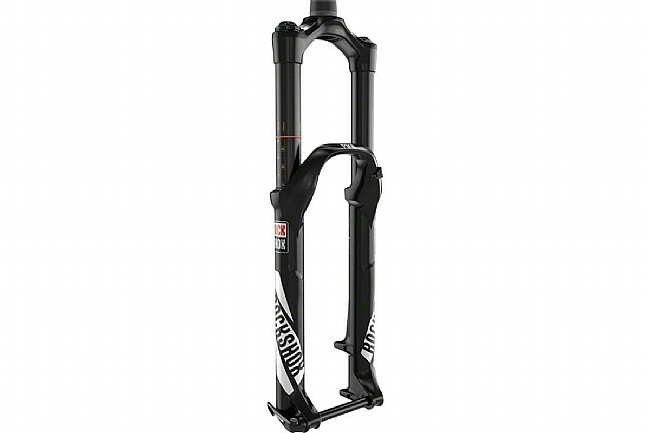 The RockShox Pike has been seen everywhere from your local trail to the Enduro World Series podium, and there's good reason for that. The Pike RCT3 29" 130 mm Solo Air Fork can go anywhere and handle any terrain you can throw at it with unparalleled plushness, predictability, and reliability. Its asymmetric chassis with 35 mm stanchions gives the Pike an unbeatable stiffness to weight ratio, and inside, RockShox's Charger Damper soaks up rough terrain like it was never there. This helped along by a Rapid Recovery system that allows for the fork to quickly recover between consecutive bumps so it doesn't pack up, and the RCT3 feature set allows you to adjust low speed compression in open mode, or set the fork trail-tuned pedaling mode or full lockout. Setup is foolproof on this Solo Air model, using just one Schrader valve to simultaneously fill both positive and negative air chambers for quick and predictable tuning with less maintenance and less weight. Aluminum steerer and fork crown. Magnesium lowers. 130 mm travel. 51 mm fork offset. Compatible with 29" wheels and 1 1/2" - 1 1/8" tapered head tubes. Includes 15 mm x 100 mm Maxle Ultimate thru-axle. Claimed weight is 1876 g.
Fell in love with this fork last year while riding a a Niner out in Sedona, Arizona. Very Smooth or as they say, Plush Had to upgrade my bike back home. Couldn't be happier. Takes a few rides to break in. Other then that it has been good. Great product, arrived exactly as described (All retail packaging included, shock pump etc). Shipping was fast and communication responsive. Great job! Im using this fork on a Canfield EPO, and it's a game changer - confidence inspiring on the downhill and while there is a little more movement climbing than on my XC forks I don't mind it.